When building any structure, a strong foundation capable of withstanding the test of time is necessary. In most projects, the most cost-effective way of achieving a strong foundation is with treated wood foundation piling. Treated marine piling used in supporting structures in and around water will remain standing for years. Foundation pilings, both treated and untreated, have been used for centuries as a permanent foundation of large and small structures. These and other designs are available by contacting Cobb Lumber. Whether your next project is a beachfront house, fishing pier or rebuilding project, our foundation piling products will hold firm. Two threats to wood exist in marine areas: marine borers and fungi. Fungi can move into the wood, invading at a cellular level and catalyzing decay. Marine borers can cause destruction when they bore into the wood; these thrive in salt water. These two threats can make wood, an otherwise ideal resource for marine piling products, an unstable material. That is, unless it’s treated timber. When wood is pressure treated, the chemicals used during the process make the wood an undesirable source of food for borers and fungi. 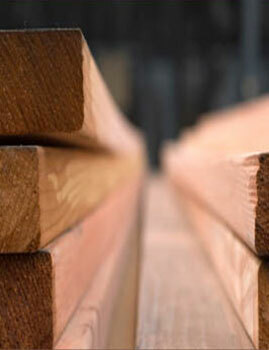 Once wood has been pressure treated it is actually superior to concrete or steel for pilings. Read more to learn how. Concrete and steel are actually inferior candidates for use in pilings that support marine or water-vulnerable structures. This might come as a surprise, since these two materials are perceived as being strong and impermeable. But steel corrodes and cannot bend and move with the wind and waves of marine environments. Concrete erodes and is expensive and difficult to repair. Treated timber, on the other hand, doesn’t lose its strength, doesn’t rust or corrode, and resists electricity conduction. It’s less expensive than steel or concrete and is flexible in ways that steel and concrete are not. It can be easily painted or stained, which is a desirable feature for foundation piling that might be visible. It also resists wind and waves more effectively as it is less rigid. At Cobb Lumber, you’ll find pilings that can be treated with Creosote, Penta or CCA; they are also available at various retention levels suitable for different applications as well as different sizes and lengths, depending on your needs. Read more about our erosion control products.